TINY STADIUMS FESTIVAL produced by PACT and Curated by Quarterbred at the PACT Theatre, Erskinville. 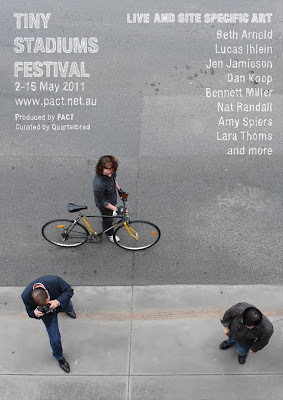 TINY STADIUMS FESTIVAL, curated by Quarterbred and produced by PACT "presents a season of performance and a weekend of works made for public spaces with live, sonic, visual and participatory projects from some of Australia's (most exciting (emerging) artists" from 2-15 May, 2011. A season of live performance simply called DOUBLE BILL, includes EXECUTIVE STRESS / CORPORATE RETREAT invented by Applespiel and CHEER UP KID by Nat Randall. They can be seen as a double bill or separately. Apppelspiel have devised a program presenting and cleverly parodying an executive stress, corporate retreat. The corporate retreat, seems, in contemporary experience, deemed a necessary adjunct to just going to work and doing the job by any forward-looking, endeavouring, earnings accretive organisation which espouses corporate social responsibility (CSR). The morale of the staff and so the company will be supported and lifted, leading to circles of strength, and charisma enhancements that assist in filling capability gaps to capture the big step improvements that will cascade down throughout the company's core values that will lead to transformative moments 24/7 that are very key and vibrant for top line growth and deliver targets of opportunity that will service the profit chain for the share holders, rightsizing the company and rendering revenue enhancements and helping the real people in the real world recognize the rationalized footprints of industry beyond plausible deniability and prejudice for best outcomes and incomes, in other words, output!!! (PROFIT). Applelspiel begins by recruiting from the attendees a group of elite volunteers for the Elite Program who will interact committedly in the Corporate Retreat with the facilitators for the benefit of the majority, so that they can defrag, cosily, as non-powered observers for their non-trivial empowerment. Lectures, games, competition, voting, " contemporary clichés, cant and management jargon" are employed from what seems to be a fairly accurate re-creation of the official management handbook for these 'infamous" staff development events. This work is best when played in deadly earnestness. When it strays in focus for laughs or attempting to involve the whole audience, especially, on my night, with smart-arse and unhelpful hecklers, it loses its edge. I also felt that the writing, satire could have been more consistently sharper and a trifle more savage. I especially enjoyed the opening speeches by the facilitating crew, and the writing never reached the same heights of wit or piercing accuracy again. With further directorial tightening and a little more cleverly resourced and targeted text this could result in a very entertaining work that could truly claim mission accomplished. The divisors and performers of Applespiel are Simon Binns, Nathan Harrison, Nicole Kennedy, Emm McManus, Joseph Parro, Troy Reid, Rachel Roberts and Mark Rogers. The second part of the double bill is a solo work by Nat Randall called CHEER UP KID "… a collection of eccentric characters and true stories with a focus on failure". Ms Randall creates for us three wonderfully observed people, all flawed, with agile vocal characterisations and a minimal costume and/or prop change. There is sad comedy here and all three reflect a mordant worldview. The cultural malaise of contemporary times seeps unhappily through the observations that are both funny and disturbing. Laughter, despite grief. The world of Barry Humphries great creation Sandy Stone rises up around Ms Randall's characters. Laughter through tears - an old Chekhov mantra. The work is still emerging. The length of the work at the moment suggests stand-up comedy sketches but the quality of the performing and the writing, direction, potentially promises a very moving and searing night in the theatre in the future. Please note that TINY STADIUMS have a LIVE ART WEEKEND on the 15th May between 11am and 3pm along Erskineville Road. Possibly,a pleasant way to spend a couple of hours. NOTE: Part of this post have been inspired by “Watson's Dictionary of Weasel Words: Contemporary Cliches, Cant and Management Jargon”, Don Watson, 2004.